Franco-Italian aerospace manufacturer Thales Alenia Space is to use 3D printing in the series production of its satellites. Applied to the company’s Spacebus NEO platform, the first run of these additively manufactured components has already been integrated into a commercial satellite project for Eutelsat Communications, which is set to launch by the end of 2019. The Spacebus NEO platform at Thales Alenia Space is a line of all-electric geostationary telecommunications satellites. Its development is jointly supported by the European Space Agency (ESA) and CNES, France’s National Centre for Space Studies. The Eutelsat KONNECT is the first satellite to make use of the new Spacebus NEO platform. Made to provide faster broadband connection to areas of Western Europe and Africa, the KONNECT is still under construction. When completed it will be capable of handling payloads exceeding 1,400 kg, with over 16 kW of power. In the most recent update on this program, Eutelsat confirmed the successful coupling of the KONNECT’s platform and its payload – a crucial step in the satellite’s preparation. 3D printed parts for the KONNECT satellite currently include four custom-designed reaction wheel brackets. Manufactured in a single part, these brackets incorporate connector and cable fittings, cutting out the need for assembly. 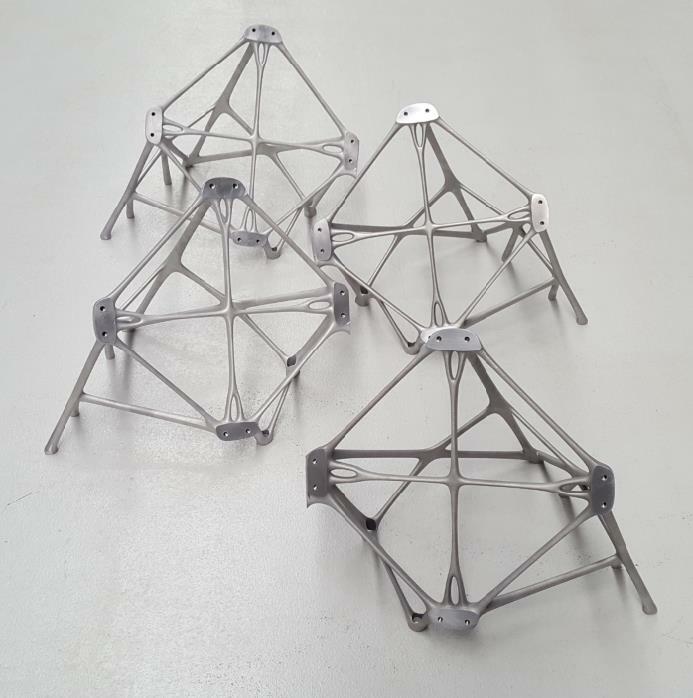 By switching to 3D printing for the production of these parts, Thales has managed to deliver a 10% cost saving, shorter lead times, and an overall weight reduction of 30%, all while increasing performance. The parts are additively manufactured on a Xline 2000R 3D printer from Concept Laser, a GE Additive company. This machine has been in use at the company for several years, previously used in the development of other components, including antenna supports. The company is also currently involved in the maturation of wire + arc additive manufacturing (WAAM) technology as part of the WAAMMat consortium. Earlier this month, the company unveiled a prototype pressure vessel made as part of this program. Related technology used to make the vessel is due for commercial release later this year. Vote now for your Aerospace Application of the Year and more in the 2019 3D Printing Industry Awards. For all of the latest 3D printing news, subscribe to the 3D Printing Industry newsletter, follow us on Twitter and like us on Facebook. Join 3D Printing Jobs to find your next opportunity.